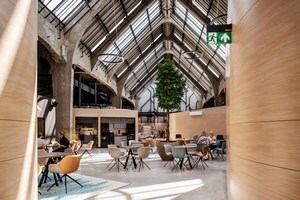 Fiverr’s new offices are located in Tel Aviv’s Beit Ha’ikarim – a historic, 4-storey building listed for conservation to which three new floors have been added. Inspiration for the design drew on the cultural-geographic context of the project’s location and the company’s cosmopolitan activity that brings together ‘sellers’ – artists and freelancers – with ‘buyers’ – entrepreneurs and small businesses world-wide. 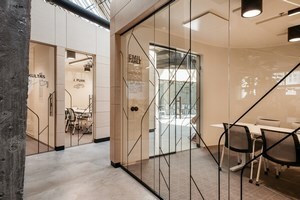 Since the offices are located in a building listed for conservation, whose renovation included the addition of new floors, it allows a natural and authentic dialogue between old and new that’s reflected in the interior design. The design produced representations of the dynamic and cosmopolitan city throughout its history, by relating to textures we found in historical strata of construction in Tel Aviv. For example, exposed old wall constructed from silicate blocks, alongside contemporary, unprocessed construction materials like exposed concrete blocks. Like the company, which has a global virtual presence, Setter Architects’ design took inspiration from patterns used world-wide, applying them in light-fixtures and woodwork, as well as in ceiling and flooring materials. The aim was to use design to create complex work environments applying global-local ideas. In the process, Setter created a fresh and distinctive language that generates a sense of a warm, human sense of space that’s familiar to everyone – workers and guests, locals and international visitors. In the office spaces we used recycled wooden window-frames from Tel Aviv’s buildings dating back to the Beit Ha’ikarim period. 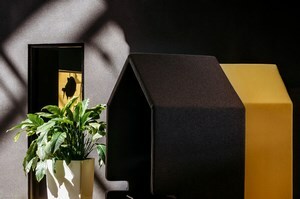 After modified their original purpose, they became inner partitions between the cozy interesting booths and conference rooms. Regular building-blocks are used in their natural form, creating walls with a three-dimensional, colorful texture, which introduces moss-green tones into brand-new spaces. Similarly, flea-market furniture is mixed with contemporary furniture. 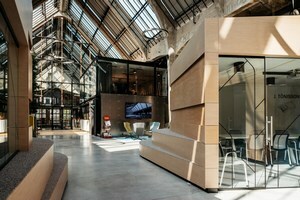 Fiverr wanted to connect the design of its offices to its international community of artists and creative people. And so the design integrates artworks produced by artists from the Fiverr community especially for the project. They are incorporated into the furniture, graphic elements, and the art displayed on the building’s concrete walls. Floors 1-6 are office floors. People work in open space, in which different kinds of conference rooms are embedded, like ‘phone booths’. The top floor, with an outdoor terrace, is the ‘public’ area, with meeting rooms, a cafeteria, and a gym for workers’ wellbeing.